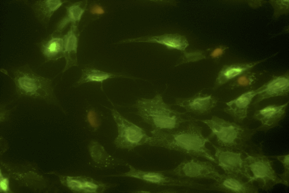 We provide high quality skeletally derived osteoblasts, osteoclasts, bone marrow stromal cells and osteocytes, as well as protocols and training for isolating, characterizing and isolating skeletally derived cells. We also develop novel techniques for isolating and studying bone cells. 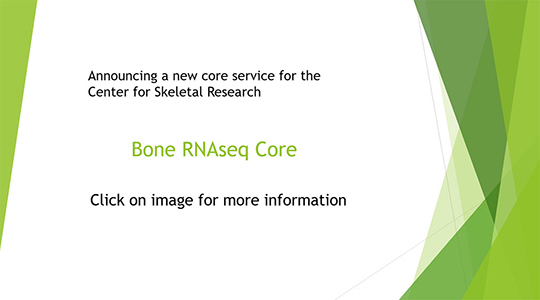 The RNA seq core will provide help and advice with designing of bulk tissue and single cell RNA sequencing experiments, help with tissue and cell preparation, access to space and equipment, expertise for performing bulk RNA extractions from bone and cartilage tissue and computational and statistical interpretation of RNA sequencing data. cAMP, IP3, iCa, ERK-1/2, Multi-Array, 1,25 Dihydroxy Vitamin D, 25-Hydroxy Vitamin D, cAMP RIA, CTX-1,FGF-23, Fura-2 iCa++, Glosensor cAMP, IP1, P1NP, p-ERK-1/2, PTH. 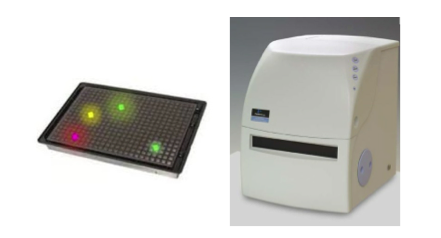 Kit assays on a per-sample cost-basis. Close interactions with the Imaging, Bone Cells and Signaling Cores will assure coordinated studies permitting imaging, histology, cell isolation, RNA and signaling analyses on skeletal elements from a single subject. High-resolution micro-computed tomography (µCT) provides provides non-destructive, quantitative and qualitative assessment of trabecular and cortical bone microarchitecture.